We have various roles for Volunteers. Almost all work in our Hallam Office is carried out by voluntary staff. If you can spare a day, or more, on a regular basis you are welcome to contact us on 1300 881 913 or 03 9796 4498 and we can further discuss ways in which you can use your skills to assist in our activities. It is important to get our message out so we can raise the funds to deliver Aid. 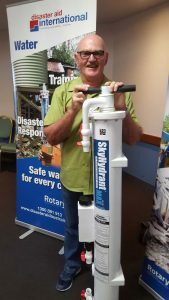 One method we find to be particularly valuable is our ‘Ambassadors’ who visit Rotary Clubs, and other service organisations to talk about the Work of Disaster Aid. We are able to provide a wide range of resources to assist you including. As our base is in Victoria, any support from other locations in Australia for an Ambassador Role is particularly valuable. The DARTs are our ‘Front line’ when managing the provision of ‘Smart Aid’. For further information on the Role check the DART page on this website. One of the key selection criteria for potential DARTs is how they have supported Disaster Aid prior to their application.